This is how I feel lately. I have a giant boy living here who can sit down in front of a bird like this and have most of it gone in 30minutes. I also have a man excellent at batting cleanup. 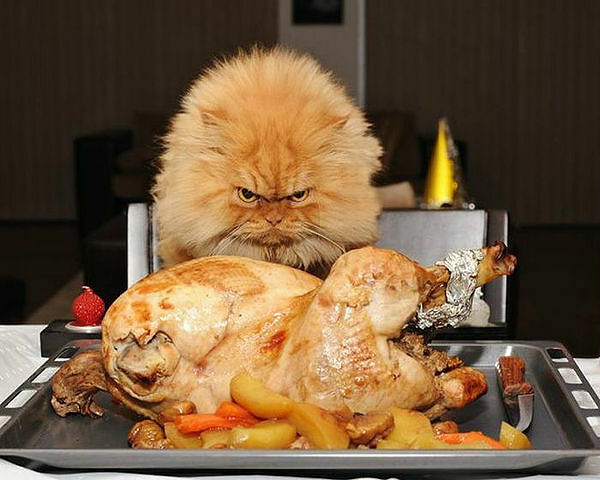 I’m the cat in the picture, always on a diet, always scowling sourly away at what others are feasting on. Maybe I’ll just stab it with one bacteria -laden claw and hope they both fall sick. Previous postWhere Do They GO?